Jean-Luc Godard’s Germany Year 90 Nine Zero – the title being a pun on Roberto Rossellini’s Germany Year Zero (1947) – was made for French television in 1991 and continued his reflexive cinema/video image/sound practice that reached its zenith with Histoire(s) du Cinéma (1989-97). Germany Year 90 Nine Zero can be considered a sort of loose sequel to Godard’s Alphaville (1965). The film follows the adventures of Lemmy Caution (Eddie Constantine), “the last of the secret agents,” as he wanders through a post-Berlin-Wall Germany (from the East to the West) through a landscape littered with history. It is 26 years later, and Lemmy is looking exhausted, vulnerable, as befits the landscape of East Germany. Alphaville situated Lemmy Caution in a near future, where the Alpha 60 computer controls the lives of its inhabitants. They are essentially reduced to the level of robots, identified only by tattooed numbers. Citizens are arrested if they question Alpha 60’s totalitarianism. Expressing free-will is a crime, and, therefore, police authority is unquestioned. References to the Fascist past include the use of the actual rooms of the Parisian Hotel Continental where the Gestapo stayed during the Occupation, while the name of the computer’s designer is Professor von Braun. Godard takes the generic and thematic components of Alphaville and refashions them as documentary/essay in Germany Year 90 Nine Zero; early sequences show images of the Third Reich, including a Hitler youth rally, a fancy dress ball, a female German SS guard. The sequence of a young woman escaping from a concentration camp is created through a mixture of staged and found footage: some shots manipulated via freeze-frames, fast and slow motion. 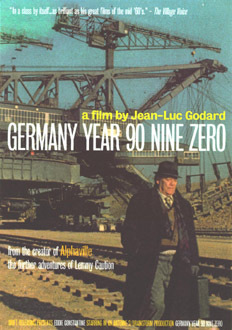 Germany Year 90 Nine Zero moves from the collapse of communism to the collapse of individual consciousness in the face of industrial capitalism. The film is used to retrace Godard’s own ideological journey from the sixties to the nineties, from the overarching context of unsustainable Marxism to corporate greed. The latter is signified by Lemmy staying at the Inter-Continental Berlin hotel. Which is worse? Capitalism or totalitarianism? A maid tells Lemmy as she makes his bed, “Work makes you free” – apropos ofthe inscription on the gates of the Nazi concentration camps. Lemmy/Godard finds it difficult to choose between the East and the West, both contributing to the schizophrenia of modern Europe. By 1965, Godard was already distrustful of America’s occupation of cinema and its inherent use of fiction genres. Alphaville, Pierrot le fou (1965) and Masculin-Feminin (1966) were progressing towards the freedom of the cine-essay – the distancing between author and audience, the acknowledgement that we are witnesses to a deliberately artificial construct. Germany Year 90 Nine Zero is a deliberate rejection of the ‘realism’ and narrative dominance of classical cinema. Godard achieves this by using several techniques: referencing the film as a film, in which footage of a Jewish woman during winter follows the title “UFA presents”; utilising other films as points of reference such as Fritz Lang’s Metropolis (1926) and Roberto Rossellini’s Rome, Open City (1945); using intertitles throughout the film as enigmatic interruptions (the title “History of Solitude” follows a shot of an SS guard framed by the barbed-wire fence of a concentration camp); introducing a number of historical or fictitious characters into the film who are superfluous to the narrative (Lemmy demands of Don Quixote, “Which way is the West?”); staged footage of an ageing Adolf Hitler and Eva Braun is also included. In addition, found footage is used and then manipulated for various effects – such as slow-motion scenes of the victims of the concentration camps, fixing these events in time – devices also used by underground directors such as Bruce Conner and Craig Baldwin. Essentially, Germany Year 90 Nine Zero returns to the Eisensteinian/Vertovian montage of Godard’s Dziga Vertov Group of the late ’60s and early ’70s. But rather than repeat dialectical slogans, he uses montage to make political, social and cultural allusions – the ultimate modernist ‘open text’ (as opposed to the ‘closed text’ of Hollywood narrative), making the audience the active explorer of an open-ended network of data, references, statements, and positions. Film distribution, especially in recent times, has been antithetical to ‘difficult’ works, in other words to films that are progressive rather than reactionary, challenging rather than safe. In 1965, Godard was able to secure Alphaville‘s financing. By this time his auteur status was assured, as was Eddie Constantine’s iconic presence as a hard-boiled secret agent in a satiric sci-fi film, since he was better known as an actor in gangster films; this assurance became a guarantee, a ‘pre-sold’ deal. Godard’s ‘avenue’ in the ’90s, however, was broadcast television, a route that bypassed the regular forms of film distribution. As is widely known, most of his films since the early ’70s have been shown exclusively at film festivals. These films have moved further away from the concerns of theatrical and ‘mainstream’ video distribution. Germany Year 90 Nine Zero runs for an hour, no doubt due to commercial broadcasting’s rigid time slots. Godard’s own summaries of Weekend (1967), “A film found on the scrap-heap”/”A film adrift in the cosmos,” can be easily applied to Germany Year 90 Nine Zero, as Lemmy wanders through the ruins of East Germany. Godard interviewed by Serge Daney in “Godard Makes (Hi)stories,” Jean-Luc Godard: Son + Image 1974 – 1991, ed. Raymond Bellour and Mary Lea Bandy (New York: The Museum of Modern Art, 1992) 164. Godard in Daney 1992, 161.